Are there any reliable documented records of members or operations of the French Resistance during World War 2? I am working on a research project in which a Polish World War 2 veteran has received a number of medals from France. I know that the veteran in question was a pilot for Britain and there is a persistent story (yet unconfirmed... other than the medals) that he was shot down in France, linked up with the French Resistance and possibly engaged in missions with members of the Resistance during his time with them before returning to Britain to continue his service there. Are there any well-documented records of members of the French Resistance and the missions these members were a part of? The purpose of this question is to find resources that might help in my search to possibly link the medals to some action taken by the veteran during his tenure with the French Resistance. My worry is that these records may have been either never created or lost due to the nature of the guerrilla warfare that the French Resistance engaged in. For that particular individual, if he was a serving RAF officer he would definitely have been debriefed on his return to the UK about his activities in France, before returning to active service. If the story of his involvement with the French Resistance is true, the there should absolutely be a record for it. Details of his activities with the Resistance may have been recorded in his service record. The fact that he was shot down and managed to return to the UK would certainly have been recorded there. RAF service records for the Second World War are still held by the MOD, and there is a procedure you have to follow to obtain a copy. If the information from his debrief was recorded by another organisation (e.g. the Special Operations Executive or MI9), then you might be able to find it in the collections of the UK National Archives at Kew. 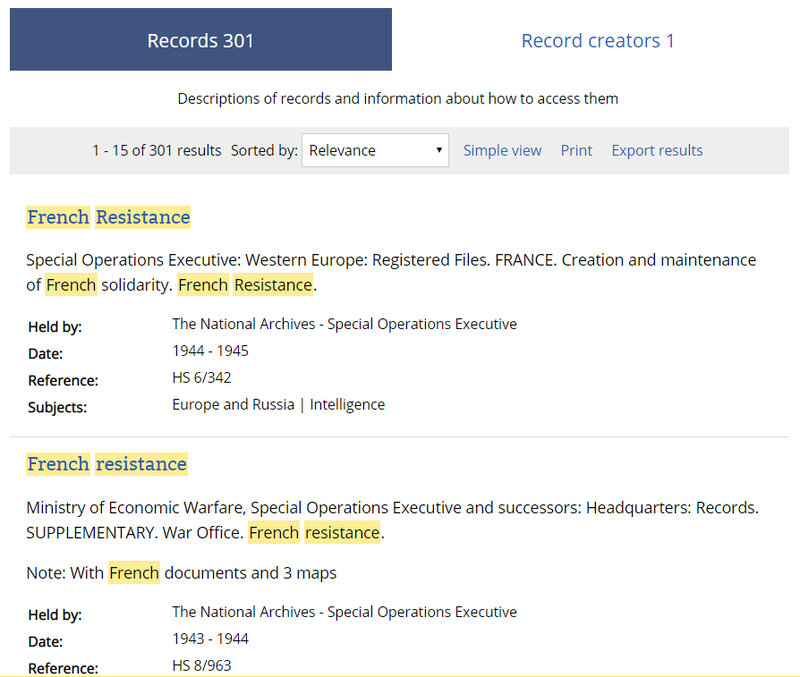 To locate records relating to the activities of the French Resistance during the Second World War held by the UK National Archives, your first step should be to search the online catalogue on their website. Most of these records have not yet been digitised, and are therefore not available online. For those records, you will either need to visit the archive in person or arrange for someone to do so on your behalf. More information is available on the National Archives website. Not the answer you're looking for? Browse other questions tagged world-war-two france resource research-techniques or ask your own question. Are there any records that indicate a submarine vs submarine battle? Why is Thailand considered an Axis power in WWII? What effect did the Attack on Mers-el-Kébir have on Great Britain's international relations during WW2? Why was Spanish Fascist dictatorship left in power after World War II? Were there documented battles of opposing air aces in World War II? Why is France a permanent member of the UN security council?